Miracast: Android Wi-Fi Display (Miracast). Transmission Protocol: Support WiFi,DLNA,Miracast Protocol. 1 Wireless Airplay Wi-Fi Display Dongle Receiver. Video Decoder: Support H.265, VP8,RV,WMV,AVS,H.263,MPEG4…etc Video Formats decode with 1080P, Support avi、vob、mkv、ts、m2ts、rm、f4v、flv、mpg/mpeg、mov…etc formats. 1 Wireless Airplay Wi-Fi Display Dongle Receiver. Network: WiFi 802.1 b/g/n support5.8G 2.4G. Video Decoder: Support H.265, VP8,RV,WMV,AVS,H.263,MPEG4…etc Video Formats decode with 1080P, Support avi、vob、mkv、ts、m2ts、rm、f4v、flv、mpg/mpeg、mov…etc formats. 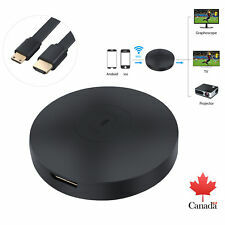 The WiFi Display Receiver is a Special Devices to project your Smart Phones / Tablet PC / Notebook to another big screen devices with HD interface (such as, HDTV, Monitor & Projector, etc) through WiFi connection. Miracast mode to connect. Wireless display has a mode switch button, press it once can switch. Miracast mode. - No need to install APP and supporting one button switch, easy and convenient to operate - Ultra low power consumption, and low heat - With compact portable design for easy carrying - Support for IOS / Android / Windows / Mac operation system - Great sharing and performance for your video, excel, PPT, PDF and other files - Suitable for projectors, smartphones. Music Format: MP1, MP2, MP3, WMA, OGG, AAC, M4A, FLAC, APE, AMR, RA, WAV. Smart appreance, Android 7.1 newest OS system, compatible with the vast majority of Android APP. Operation System: Android 7.1. Features WiFi display dongle supports DLNA/Airplay Mirror/Miracast Function. Perfect for watching movies, conference use and gaming to pursuit different audio-visual feast. Plug and play, instant to enjoy audio and video synchronization, no delay. Stable WiFi connection and strong anti-jamming for smoother data transfer. Widely compatible with both Android, iOS mobile phones and tablets and Apple MAC system computers. Compact and mini design, convenient to carry and use. MiraScreen WiFi Display Receiver. MiraScreen Hardware Specifications MiraScreen Specifications 1 MiraScreen Wireless WiFi Display Receiver. Supports Popular standards, such as Miracast, DLNA and Airplay, can enhance your HDTV / Projector / Monitor with HD input socket. Connect the HDMI connector of MiraScreen G2 to the HDTV or projector. 1 x MiraScreen G2 Wireless HDMI Dongle. Just plug and play, no needed any other drivers, and with a switching button, you could switch Airplay mode or Miracast mode easily. Type: WiFi Display Dongle. 1 x WiFi Display Dongle. Interface: 1 x HDMI, 1 x Micro USB. Due to the light and screen setting difference, the item's color may be slightly different from the pictures. Allowing you to enjoy mass Internet resources on the big screen. Built-in WiFi module supports 2.4GHz WiFi, supporting Online & Local content wireless display: Video / Audio / Photo / Office file / Website. MKV, WMV / VC-1 SP / MP/ AP, MPG, MPEG, DAT, AVI, MOV, ISO, MP4, RM, H.265, Real Video 8 / 9 /1 0, Up to 1080P. AnyCast M4 Plus WiFi Display Receiver HDMI 1080P TV Stick DLNA Airplay Miracast. should choose the Airplay/DLNA mode of the wireless display receiver to connect. Android phone can connect directly under Miracast mode. Type: WiFi Display Dongle. 1 x WiFi Display Dongle. Interface: 1 x HDMI, 1 x Micro USB. Allowing you to enjoy mass Internet resources on the big screen. 1 x USB Cable. Due to the light and screen setting difference, the item's color may be slightly different from the pictures. DVB-T2 Smart TV Box HDMI STB 1080P HD TV Digital Terrestrial Receiver USB2.0 DVB T2 Set-top Boxes. Video output resolution: 480i/576i/480p/576p/720p/1080i/1080P. AUTO, 16:9 Pillar Box, 16:9 Pan G Scan, 4:3 Letter Box, 4:3 Pan G Scan, 4:3 Full, 16:9 Wide Screen. Video Output: CVBS, VGA, HDMI. VGA: VGA output x 1. TV Box Type: with VGA. VGA output for LCD/CRT monitor. TUNER: Aerial Inout x1. 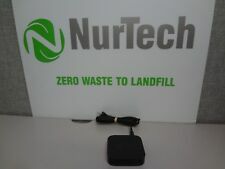 1pc x TV Box (with VGA). RF Input Connector: (IEC-TYPE, IEC169-2, female). Features: The MiraScreen WiFi Display Receiver is an high-tech device that can project your smartphone or tablet pc with confined screen size to TV, Projector or similar, and allowing you to enjoy the ultimately big screen. Easy access to big screen for game, big screen for pop movie, enjoy photo on tv, on-line video, Car WiFi display, etc What is Mirascreen? Mirascreen=Eblarge mobilephon/tablet opc screen through latest wifi tech, and mirror to biger screen like TV/Projector. 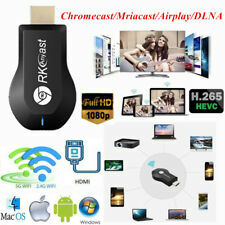 Android 4.0/4.1 GOOGLE TV DONGLE - Full HD 1080P, 1.5GHZ, DDRIII 1GB, Bulit-in WIFI, WAPI, HDMI. Specifications:Operation system:Android 4.0/4. main Chip:VIA WM8850 (CorteX-A9 1.5GHZ) GPU:Mali 400. The users would be able to completely exploit the power of Android with quality hardware of AVOV to have smooth lag free experience some of the features of the device are discussed below. Wireless screen mirroring, sync mirror the entire screen for iOS and Android smartphone, tablet PC to HDTV or projector, perfect for PPT presentation and big screen movie. External WiFi module, supports 802.11b/g/n wireless connection, 2.4GHz WiFi, strong signal, supporting Video, Audio, Photo, Office file wireless display. Operating System Android 4.4. Network 2.4GHZ WiFi 802.11 b/g/n Wireless, LAN 10M/100M. Resolution Full HD 1080P. 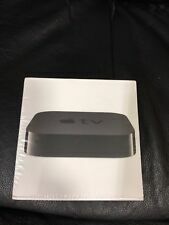 BRAND NEW SEALED Apple TV 3rd Generation MD199LL/A - Black -HARD TO FIND!!! !